The U.S. Citizenship and Immigration Services (USCIS) has announced a new rule to help international entrepreneurs work in the United States for up to five years in “parole” status. The rule, published on January 17, takes effect July 17, 2017. As background, the United States lacks a visa specifically for entrepreneurs. Until now foreign national startup founders have had to try to fit within one of the existing visa categories. 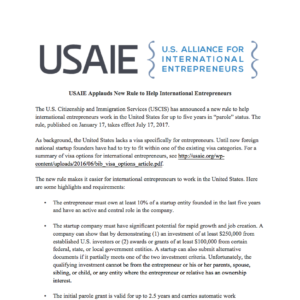 USAIE has put together a summary of visa options for international entrepreneurs, available here. USAIE applauds the new rule. Read a summary below, or click here for a PDF version. The entrepreneur must own at least 10% of a startup entity founded in the last five years and have an active and central role in the company. The startup company must have significant potential for rapid growth and job creation. A company can show that by demonstrating (1) an investment of at least $250,000 from established U.S. investors or (2) awards or grants of at least $100,000 from certain federal, state, or local government entities. A startup can also submit alternative documents if it partially meets one of the two investment criteria. Unfortunately, the qualifying investment cannot be from the entrepreneur or his or her parents, spouse, sibling, or child, or any entity where the entrepreneur or relative has an ownership interest. The initial parole grant is valid for up to 2.5 years and carries automatic work authorization. International entrepreneurs can extend their parole status for an additional 2.5 years if they can show their startup continues to have substantial potential for rapid growth and job creation. Spouses of international entrepreneurs can apply for work permits. Up to 3 entrepreneurs per startup can qualify for parole. The new rule does not offer a direct path to a green card. But it allows international entrepreneurs who qualify a more direct way to temporarily live and work in the United States while they grow their startup companies. USAIE will share more information about the new entrepreneurs parole rule in the coming weeks. USAIE provides targeted immigration presentations and advising to universities, accelerators, incubators, and other organizations supporting entrepreneurs. Contact USAIE for more information. If you are an individual or startup looking to understand if you qualify for the new parole rule, contact info@usaie.org for a direct referral to one of our founding members. This entry was posted in News and tagged Final Rule, Parole, USCIS. Bookmark the permalink.